Give your guest the most comfortable sleep they will ever have with this High Weight Capacity Twin Size Extra Long roll away memory foam guest bed. The bed folds easily for convenient storage and features a durable tubular steel frame and a medium support memory foam mattress. Set includes: Tubular steel frame with flexible wooden slat base and memory foam mattress Support: Medium Weight capacity: 450 pounds Materials: 4 pound high density polyurethane foam, tubular steel frame 5 inch memory foam mattress with Flame Watch Protection Flexible wooden slat base provides added comfort Easily folds for convenient storage Durable cover designed to last for years Mattress and Cover is FIRE RETARDANT - Tested meeting USA and California Laws 16 CFR 1633 Dimensions: 5 inches high mattress x 38.25 inches wide x 76 inches long x 17 inches from the floor to the top of the mattress. Hotel Style Roll-Away Bed. Hotels Add To The Versatility Of A Guestroom With A Fold-Down-Roll-Away Bed. At Home, Quickly Transform Any Space Into A Guest Room With This Convenient, Portable Sleep System. Features:* Sturdy Steel-Angle Construction For Stability. * Includes 5 In. Premium Foam Mattress. Also available (At Extra Charge) 5 In. Thick Innerspring Mattress With Tempered Steel Coils. * Polypropylene Deck Is Snag, Squeak And Rust Resistant. Two Big 8 In. Fixed Position Wheels And Two 5 In. Ball-Bearing Swivel Wheels. Easy To Move Up Stairs, Over Curbs And Other Difficult Areas. Designed To Fit Easily In A Closet For Storage When Folded Up. When An Unexpected Guest Arrives, Just Roll Out This Handy Hotel-Style Bed. Available In Three Sizes: 30 In., 39 In., or 48 In. Wide; All 75 In. Long. When Folded, Bed Measures 50 In. High, 18 In. Deep, Width Varies 30 In., 39 In. Or 48 In. According To Model. The height from the floor to the top of the mattress is 17 In.If you want just the Bed Frame with no Mattress the price is $175.00 each.Mattress and Cover is FIRE RETARDANT - Tested meeting USA and California Laws. The Weight Capacity Is 275 LBS. Strong Construction. Compact and versatile, The Sigma Folding Bed comes with a Spring Orthopedic Mattress Approx. 4-1/2 In. Thick. ** Limited Time Free Protective Cover Included With The Bed ** The Twin Size Luxurious Folding Bed is simple and easy to use. Complete Metal Folding Cot With Springs And Premium Foam Mattress. Spring Mattress available at extra cost. Special Ball-Bearing Wheels included. No assembly required. Available in 30, 39 and 48 In. Size. with 4 In. or 5 In. Mattress. The quoted price is for the 30 In. model with 4 In. Foam Mattress. For prices on the other models please see the option below. Vinyl Anti Static Mattress Protection is available at extra cost. Cot Size Dimensions: 30 In. x 75 In. Frame. Twin Size Dimensions: 38 In. x 75 In. Frame Small Full Size Dimensions: 48 In. x 75 In. Frame.The height from the floor to the top of the mattress is approximately 20 In. * Mattress Size is the Same as the Frame Size.The Bed is shipped fully assembled except the wheels need to be hand screwed in the housing.The Weight Capacity Is 285 lbs.Mattress and Cover is FIRE RETARDANT - Tested meeting USA and California Laws. In Stock. Normally Ships within One to Two Business Days. Discount Available For Product and Shipping On Large Orders. The Twin Size Ritz Roll-away Bed with Premium Innerspring Mattress. • Licensed by the Bureau of Home Furnishings and Thermal Insulation to open flame test criteria 16 CFR 1633 & 16 CFR 1632.4. • Extra thick Inner Spring Mattress 5.5 In.(included). • Paded Head board • Open Size: 36 x 20 x 79 in. Long with four swivel wheels. Closed Size: 36 x 42 x 17 in. • Case dimensions: 37 x 18 x 43 in.• Weight Capacity 300 lbs. Weight: 83lbs. The mattress is removable from the frame. Sure, these cost more than what you have seen elsewhere. But, these are the heavy gauge, all steel roll out beds you remember from your childhood. Plus, these beds and mattresses are Extra-long so even adults can sleep comfortably. 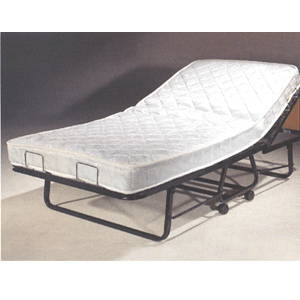 Deluxe, Heavy Duty Angle Steel Roll-away with coil spring and mattress. Sturdy construction, 8 In. wheels for ease of mobility. We have mated the strongest roll away bed with the most comfortable mattress, a 5 In. thick innerspring mattress with tempered steel coils. Rated capacity of 250 lbs. by the manufacturer. Double braced angle steel frame gives extra rigidity and long life, coil spring foundation for added support, link support deck, automatic leg opening, with large wheel kit. Quantity Pricing available, please inquire. Includes a Lifetime Ltd. Warranty. Available in 39 In. Wide only.Length: 80.0 In. Width: 39 In. Weight: 71.0 lbs• Mattress and Cover is FIRE RETARDANT - Tested meeting USA and California Laws. *In stock. This product normally leaves our warehouse within 1-2 business days. * Quantity Discount Available. Heavy duty steel angle undercarriage supports add stability to bed. Polypropylene fabric deck attached with 12 gauge tight wound helical springs. Full swivel 5 In. ball bearing casters and 8 In. back wheels for easy movement up stairs, over curbs and on rough walks. No-Sag support with high performance sinuous wire strands in middle of bed for extra support in body weight areas. Available with 4 In. foam or innerspring mattress. The price includes the bed and mattress. Choose from 30 In., 39 In. or 48 In. wide models. 39 In. bed folds to 48-1/2 In. (H) x 16 In.(D). Bed Weight is 30 In. foam is 80 lbs. 30 In. Innerspring is 85 lbs., 39 In. foam is 85 lbs., 39 In. Innerspring is 90 lbs., 48 In. foam is 90 lbs., 48 In. Innerspring is 95 lbs.• Mattress and Cover is FIRE RETARDANT - Tested meeting USA and California Laws. *In stock. This product normally leaves our warehouse within 1-2 business days. * Quantity Discount Available. Do not get caught without bed space when company shows up. Get these 38-inch and 31-inch folding bed frame with 4 inch Premium Foam Mattress. The frame with link springs folds into three sections. The center section has two U shaped legs with casters. The ends each have a section with a U shape leg without casters. This black metal folding bed is made with durability for long usage. The four inch thick pad that comes with this bed has a black covering. The pad folds up inside the bed frame. There are latches for locking the bed folded. These beds will fit in a closet or attic until needed. Very Light Weight Folding Bed. Includes a 4 In. Mattress. Steel Frame (No Springs). Locking Wheels. No assembly required. Available in 38 In. (W) and 31 In.(W). The Length is 75 In. Long. The Ht. is 11.5 In. The Rome Extra Long Premium Guest Bed with 4 In. Foam Mattress.Freatures: * Bunkie Board All Wood Mattress Support with Quality Fabric Cover * Preimium 4 In. Foam Mattres with Quality (Included With Bed) * -Mattress and Cover is FIRE RETARDANT - Tested meeting USA and California Laws. * Strong Steel Metal Frame * 4-Strong Wheels * Very Minor Assemble. (You only need to screw the wheels into the housing) * Wooden Headboard. (Can be used as shelf when in storage)* Wt. Capacity 275 lbs.Size: 75.2 In. (L) x 33.9 In. (W) x 15.7 In. (H).Quantity Discount Available. A Great Space Saving Folding Bed. Strong And Durable. Tubular Heavy Gauze Steel Frame Makes It Stable And Sturdy. Strong Construction.Dimension: 74 In. (W) x 31.5 In. (D) x 15 In. (H).Quantity discount is available. Complete Folding Bed with Foam Mattress. Strong Construction. Easy To Fold And Unfold.The Folding Guest Bed Features:-Comfortable 4 In. Thick Premium Foam Mattress (Included With The Bed).-Mattress and Cover is FIRE RETARDANT - Tested meeting USA and California Laws.Bed Measures: 77 In. (L) x 39 In. (W) x 18 In.(H). Chair Measures: 38 In. (L) x 39 In. (W) x 36 In.(H).Wt. Capacity is 300 lbs.Some assembly required. Complete Folding Bed with Metal Frame and 4 In. Inner Spring Mattress. Features 12 Wooden Slats for quite sleep and support. Four Wheels for easy mobility. The Metal Frame is in black finish. Mattress Color will not be as shown.Size: 31 In. (W) x 74 In. (L) x 13 In. (H) In Stock. This item usually leave our warehouse in 1 to 2 business days. Be ready for guests anytime with our Folding Roll-Away Bed Frame and Mattress! This high quality tubular frame, industrial strength wire mesh decking and oversize ball-bearing wheels were build for hotel use so you can count on both comfort and quality. When you are done using the bed, just fold it in half and roll it into storage. Score a great value with this one-time special buy. Hurry - supplies are limited! • Strong, durable heavy guage tubular steel • No need to assemble - ready to use right out of the box! • Oversize ball-bearing wheels • Mattress features 5 In. of high density polyurethane foam with blue damask • ticking on all sides • Standard 38 In. x 74 In. Twin Mattress included • 1 Year Warranty on both the mattress and frame • Finish/Color: Black Frame, Blue Mattress • Made in: USA • Care Instructions: Dust frequently using a clean, specially treated dusting cloth that will attract and hold dust particles.• Height: 24 In., Width: 40 In., Length: 76 In. Weight (lbs): 44The Weight Capacity of the Bed is 275 lbs. Material: Heavy Gauge Tubular Steel Discount Available For Product and Shipping For Large Orders.